Kotick Wants Call of Duty Subscriptions "Tomorrow"
Like it or not, Call of Duty is going to have a subscription service attached to it sooner than we might think. Activision has talked about adding a subscription service to its Call of Duty franchise in the past, but now CEO Bobby Kotick is itching to make it happen soon. How soon? Tomorrow, if possible. When asked by the Wall Street Journal what he would do with his company if he had one wish, he replied: "I would have Call of Duty be an online subscription service tomorrow. When you think about what the audience's interests are and how you could really satisfy bigger audiences with more inspired, creative opportunities, I would love to see us have an online Call of Duty world. I think our players would just have so much of a more compelling experience." He left out that it would also generate millions of dollars, but that's pretty much implied. Kotick added that this kind of service is "hopefully" coming, and that he thinks "audiences are clamoring for it." But this isn't just about making money, it's also about expanding the Call of Duty experience and creating something bigger, if Kotick's further comments ring true. He also said: "I think we could do a lot more to really satisfy the interests of the customers. I think we could create so many things, and make the game even more fun to play. We haven't really had a chance to do that yet." It wouldn't be crazy to expect a subscription service somehow associated with the Call of Duty franchise sometime by the end of 2011 if the top dog of Activision wants it to happen "tomorrow." I'm wondering exactly what this would mean, though Kotick's comments hint that he wants a persistent world that is still experienced through consoles rather than PCs. 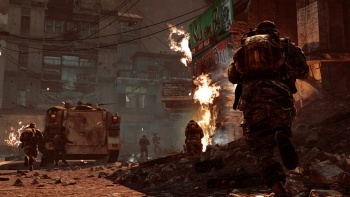 You never know, the MMOFPS genre that hasn't typically lit the online PC world on fire could be a perfect fit for the millions of people playing Call of Duty on the Xbox 360 and PlayStation 3.